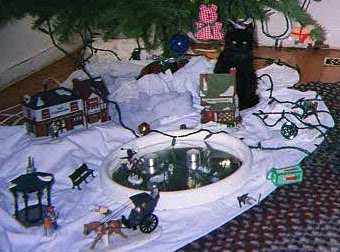 In a last ditch effort to stop Christmas from coming, I have sent a giant kitten down to terrorize this quaint Dickensian village. In honor of the season, I give you the lyrics of the greatest Christmas carol ever written. * The first two verses are the best known; the rest are alternative verses that have surfaced over the years. And now, with out further ado: Boston Charlie by the great Walt Kelly. Now, get out there and shop like your job depended on it. * Or perhaps it's the greatest War on Christmas carol ever written. This is one of those lists where you bold the things you've seen or done. I was surprised at how well I did (26 and a couple halves) considering I'm not a geologist and not especially well traveled. Fortunately, the northwest corner of North America is a very geologically rich territory. I could have done even better. When I was a kid, my family traveled through a few more places on the list and either didn't stop or had no idea what we were seeing. Chris Rowan, the main geology blogger over at ScienceBlogs got 38 and a couple halves. 4. Visit the Cretaceous/Tertiary (KT) Boundary. 5. Observe (from a safe distance) a river whose discharge is above bankful stage. 9. See an ophiolite, such as the ophiolite complex in Oman or the Troodos complex on the Island Cyprus. 32. Fluorescent and phosphorescent minerals. 34. Lava tubes. [in a couple places in sotheastern Idaho]. 48. The Dalmatian Coast of Croatia, to see the original Karst. 75. A catastrophic mass wasting event. 76. The giant crossbeds visible at Zion National Park . 78. Barton Springs in Texas. 91. Witness a tornado firsthand (Important rules of this game). If they're going list atmospheric phenomena, I think I should get credit for sundogs and solar halos. Do we need to cut a smaller federal district out of the new state? Yglesias thinks we do and even has a map of his proposed tiny district. Several commenters and I think it's unnecessary. Most European capitols are just cities with no special jurisdiction. The original point in a federal district was that, in a federal system, the state with the capitol would have an unfair advantage over the other states. The compromise was to see that no state had the capitol. Several countries with federal systems, besides the US, have gone down this path, but plenty of others have not and incurred no special problems from making that choice. How do we arrange the stars on the flag to fit fifty-one? That's already been figured out. The answer is alternating rows of eight and nine stars. To make it esthetically balanced it helps to lengthen the blue field. Another possibility is to give up on the star-for-state motif and go back to the circle of thirteen stars. What will we call the state? Columbia seems kind of redundant. There is already a country of that name in the Western Hemisphere and a province of that name in Canada. Greece objects to letting the country to their north use the name Macedonia because they have a province of that name. They claim anyone else using the name is an implicit claim on their territory and a threat to their territorial sovereignty. I don't think Columbia or Canada is quite that insecure, but why risk it? This is a chance to add a new name to the map. Washington is taken. Don't even think about something lame like East Washington. Potomac is a good possibility. Anacostia (the name of a small river that runs through the south side of the city) is nice. Feel free to make suggestions in the comments. Will they need to have a separate state and city governments? No. There is no law preventing a state from being a single incorporated municipality. Many countries have city states/provinces. Rather than build a second set of government buildings for the state government, It's perfectly okay to simply change the names of everything; the mayor becomes the governor and the assembly becomes the legislature. It's not even necessary to have a state senate; Nebraska has a unicameral legislature and does just fine. The biggest expense for the new government would be ordering new stationary. Should these people get to have the same vote as everyone else in the country? Some one actually asked that question. SamChevre wrote, "I’m in favor... as long as we get an amendment that no one getting a government check that represents more than half their income may vote." Of course if this rule were applied to all states, as it would have to be, it would mean that all civil servants, active military, Congress, their staffs, welfare, social security, unemployment, and military pension recipients would be disenfranchised. there was, in fact a time when the military and the residents of DC were not allowed to vote. DC finally received the right to vote for president in 1961 and the last state laws against military voting were finally thrown out in 1971. SamChevre's comment gives voice to a trend I noticed among conservative pundits during the election, who seriously suggested that this democracy thing should be rolled back. Some advocated removing the right to vote from certain groups (those inclined to vote Democratic). Others suggested giving additional votes to more "deserving" voters (the rich). This is a very disturbing trend that we should keep an eye on. Are you really sure we don't need an amendment? Not according to my reading of the constitution. The twenty-third amendment regulates the voting rights and (limited) representation of the district, but doesn't require us to have a district. Article one, section eight gives Congress power over a federal district, but I don't read that as requiring us to have on. Perhaps any constitutional scholars out there can shed further light on the question. Any other new states on the horizon? Puerto Rico is the leading contender. Statehood for Puerto Rico would deal a near fatal blow to the English national language movement and would be worth it just for that. The independence movement is almost as strong as the statehood movement in Puerto Rico. The Pacific island territories of Samoa, Guam, and the Northern Marianas are more distant contenders. The problem for all of the island territories is that we have created so many economic advantages for them in their current statuses that it would be a step backward for them to trade those in for a few seats in Congress. Finally, if Canada ever breaks up, the Maritime provinces would be ripe for joining, though Ontario and the western provinces would be more inclined to go it alone. I had just finished the previous post when Clever Wife called to say her whole office had been laid off. They're offshoring the work to China. I'm so happy for China. My whole family gathered at Mom's for Thanksgiving. My sisters flew down from Alaska. My niece, who had a baby three weeks ago, brought the first great-grandbaby over so Mom could hold him and they could pose for the obligatory four-generation picture. Clever Wife and I drove over from Seattle. Number Two Sister made a dinner that couldn't be beat. Some of Mom's friends dropped by to have a bite and toast the hostess. We watched a movie with the kids. We took turns holding Mom's hands while she died. Today should have been her eighty-fifth birthday. In 1911 my grandfather graduated from college with a degree in electrical engineering. He was the first college graduate in his family. He loaded his things into the sidecar of an Indian motorcycle and headed west to seek his fortune. After a few years spent installing and repairing equipment in the mining camps of Montana, he met a schoolteacher and they were married. The Great War interrupted their plans to settle down. He enlisted and spent a year training recruits at Ft. Lewis in Tacoma, WA. After mustering out he and his bride returned to Montana and the mining camps. Soon after, they had two kids, a boy and then a girl. My mom had a pretty good childhood. With two college-educated parents--a rarity in those days--she grew up exposed to fine culture and acquired a life-long love of theater and words. 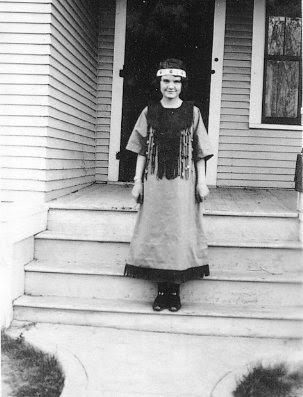 Most of the pictures I have of her as a child are of her on the back porch of their home, showing off a new costume that her mother had sewed for her. The houses changed, but the pose remained the same. By the end of the twenties, her father was able to open a shop in Great Falls. Although the Depression had hit by then, he was the only person between Spokane and Minneapolis who could rewind an electric motor, so he was guaranteed a trickle of work. When things got tight, he knew they just had to wait and sooner or later something would break at the telephone or telegraph offices, along the railroad, at the mines, or, later, at one of the big government works projects like the Ft. Peck Dam. Life was secure with her calm, confident father. Mom went to college just before The War broke out. She studied theater and English for a couple years and then got a job as a Rosie the Riveter, fixing aircraft that were being sold to our Russian allies. After the war ended, she finished her degree and moved back in with her parents to take care of them. In 1946, her father took a year-long job installing equipment on the Ft. Peck Dam. She moved there with her folks. At a community dance, soon after arriving, she was introduced to a veteran, the son of a cowboy, who was drifting through minor government jobs while deciding what to do in civilian life. They hit it off and were married the next year. That, of course, brings the story back to my sisters and me. As our mom, Mom was a great mom. She practiced momming in an old fashioned way. She cooked everything from scratch. She was a great baker. All of us kids are cooks and love to experience new foods. She sewed many of our clothes. One of my sisters is a prize-winning seamstress. She was involved in our educations and encouraged us to do kid things back in the days before preschoolers worried about filling up a resume. We learned lots of arts and crafts. We are all voracious readers. She was the den mom for my Cub Scouts. She loved to go dancing. I never picked up that skill, but I can draw. She was involved and active right up to her last weeks. Even in her seventies, I had trouble keeping up with her and needed a few days to depressurize after visiting her. Just two weeks ago, when I took her to the doctor, she had to fuss over her appointment book to arrange her medical appointments among her club meetings and holiday plans.